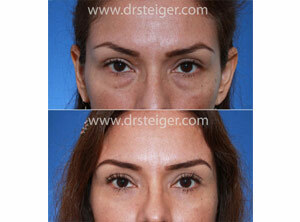 Blepharoplasty (Cosmetic Eyelid Surgery) is a cosmetic procedure performed to enhance the appearance of your eyes. The eyes are the most engaging facial feature, and should be the focal point of the face. 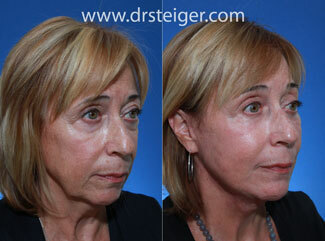 The process of facial aging often detracts attention from the eyes. In fact, the goal of aesthetic facial rejuvenation is to restore attention back to the eyes. A well shaped eyelid is a cornerstone of youth and beauty. Age brings changes to the eyes themselves. Loose skin develops, fatty pouches form, and eyelid shape is altered. The eyes are unfortunately the first part of the face to show aging, often appearing as early as in the late 20’s. 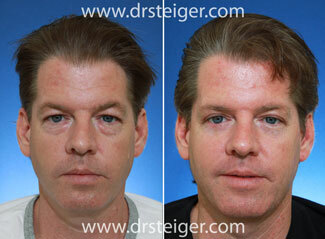 Dr. Steiger can restore a more youthful appearance to your eyes using advanced blepharoplasty techniques. Eyelid fullness is an essential component of a youthful appearance, which Dr. Steiger believes should be maintained/restored. He focuses on restoring your eyelid to its youthful state, giving you a more rested look. To enhance the appearance of the eyes and provide a more rested look by restoring the eyelid to a youthful state. Upper Eyelid- The incisions are hidden within the upper eyelid crease. 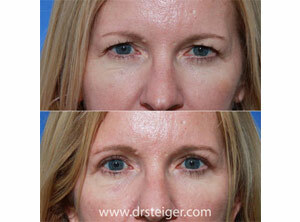 Eyelid skin and fat are augmented in order to rejuvenate the upper eyelid. Lower Eyelid- Incisions are made on the inside of the eyelid and occasionally under the lash line. 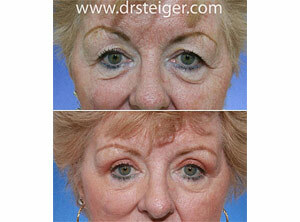 The fatty pouches are either repositioned or removed to restore the eyelid to a more youthful appearance. Deep sedation/twilight sleep is preferred, however some patients opt for a general anesthetic. 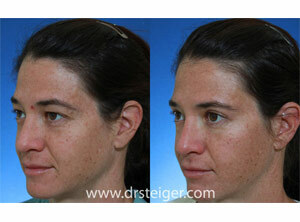 The procedure averages between one to two hours. It is performed in our state of the art, fully accredited outpatient surgical facility or at the hospital. Other procedures, such as a facelift, brow-lift, laser or chemical skin resurfacing, and facial fat transfer may be combined with eyelid surgery and may be recommended after a detailed consultation with Dr. Steiger. Most patients go home comfortably after the procedure. If you prefer, professional in-home nursing care or overnight hospital suites are available upon request. Our friendly staff can assist you in coordinating these services upon request. Most patients return to work within 1 week and are back to full activities after 10 days. Bruising around the eyes may occur in some cases, and can be camouflaged with make-up. Most patients feel remarkably well immediately after the procedure, and have minimal pain which is alleviated with a mild narcotic. Dr. Jacob D Steiger MD is South Florida Eyelid Surgery specialist board certified by the American Board of Facial Plastic and Reconstructive Surgery and the American Board of Otolaryngology- Head & Neck Surgery. He practices in Boca Raton and Delray Beach, Florida treating patients from Palm Beach, Ft. Lauderdale, Miami, as well as patients from all over the US and from around the world.